Under 9 Blitz v Inniscarra. Our under 9 hurlers continued their good form in the hurling league against Inniscarra in Blarney this month. Both clubs demonstrated great skill, effort and commitment in 4 very competitive games. It was great to see the progression these lads are making as the season continues. There were some great scores and defending from both teams and the skills of the game such as blocking, striking and rising were all on display. 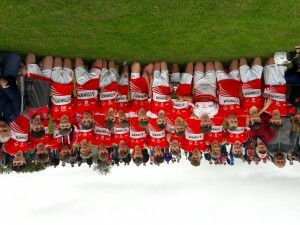 Blarney Footballers in Munster Tournament. Blarney’s Daniel Murphy and Eoghan Kirby lined out for Cork Mid-West in the Jim Power u14 football tournament in Dungarvan on Saturday the 8th of July. The Jim Power tournament involves county and regional development teams from across Munster, offering a great opportunity for the lads to test themselves against the best footballers in the province. It’s been a really busy year for Daniel and Eoin who’ve represented Blarney GAA with distinction at club and regional level. Camogie U16 players. Well done to the Cork under 16 A team and Blarney Camogie players Jennifer Murphy and Orla Cremen on qualifying for the All Ireland semi-final. U14’s are County Champions! Congratulations to Blarney GAA U14 hurlers, captained by Denis McSweeney, who are the new County Hurling Champions having beaten Killeagh/Ita’s the P2A county final today. Blarney Abu! Cork U17’s win All Ireland Final. Huge congratulations to Shane Barrett and Declan Hanlon who were part of the Cork u17 hurling team who won the first ever All Ireland championship at the grade at Croke Park on the 6th of August. In a hard-fought contest Cork prevailed over Dublin by 2 points on a final scoreline of 1-19 to 1-17. Declan started at centre forward and claimed 3 points from play, while Shane came off the bench. It was a fantastic achievement for two very dedicated players and a proud day for the club. Junior A Hurlers. The Junior A hurlers progressed to the quarter final of the Muskerry championship with a win over Gleann na Laoi on Wednesday the 5th of July in Donoughmore. The lads were deserved winners on a scoreline of 1-19 to 1-12 winners after a hard-fought game. The lads faced Kilmichael in the quarter final in Coachford on the 4th of August. In a thriller of a game, a point in extra time saw Kilmichael to a 3-12 to 3-11 win. It was a brave effort from the lads but just fell short on the night. Tim Duggan and Willie Cronin’s men fought to the very end and can hold their heads high. Minor Hurlers. It’s been a busy month for the minor hurlers who’ve played two championship matches in July. The lads fell to a tough 2-21 to 1-9 defeat to a star-studded Na Piarsaigh team on the 11th of July but got their campaign back on track, defeating Carbery 2-19 to 0-17 in Coachford on the 30th of July. The lads face Duhallow in the next round. Disappointing defeat at Páirc Uí Chaoimh. The Premier Intermediate hurlers bowed out of the 2017 championship with a disappointing defeat on the inaugural match in the re-developed Páirc Uí Chaoimh. It was a big day for club and county but unfortunately the final scoreline of 1-8 to 1-21 in favour of Valley Rovers did not live up to the occasion from a Blarney perspective. A huge crowd of over 10,000 people turned up to inspect the county board’s handiwork on a cool and blustery evening. Valley Rovers started with the wind to their backs and quickly claimed the first point of the night. Alan McEvoy equalised for Blarney with a fine point in the second minute but Valleys claimed the next three on the trot to lead 0-4 to 0-1 after 10 minutes. Two Mark Cremin frees and a lovely Shane Mulcahy point on the run got Blarney back in the game but points were hard to come by against the wind. Valleys claimed some good scores as the first half wore on and Conor Murphy was forced into three smart saves before the whistle. The score at half time was 0-11 to 0-6 with Blarney due to have the benefit of the breeze in the second half. The under 8 teams from both clubs took the field at half time and put on a great exhibition of hurling to keep the crowd entertained over the break. Blarney made several positional switches for the second half but got off to a slow start, conceding two points in the first two minutes. Mark Cremin cut over a peach of a sideline ball in the 34th minute but Valley Rovers responded with a goal shortly after, and continued tacking on the points until Mark Coleman claimed a point from a free in the 47th minute. David Cremen slotted away a consolation goal in the last minute but it was too little too late for Ray Murphy’s men. It was a great honour for Blarney GAA to be involved in this historic occasion and while we’re disappointed with the result we would like to thank Valley Rovers for a sporting game and wish them well in the rest of the championship. Blarney; Conor Murphy, David Walsh, Paul O’Leary, Brian Walsh, Conor Power, Mark Coleman, Joe Jordan, Keith Costello, Cormac O’Mahony, Stephen Lohan, Colin Murphy, Alan McEvoy, Mark Cremin, Danny Whyte, Shane Mulcahy. Subs: Peter Philpott, Ray Murphy, Paul O’Connor, Eoin Hyland, Davin Cremen, Sean Crowley. Championship Defeat for Junior Footballers. The Junior footballers were knocked out of the the Muskerry championship early in July after a brave effort against Clondrohid. The final score of 1-13 to 0-8 wasn’t truly reflective of the general play. Blarney were shorn of a number of regular starters but were far quicker to settle into the game, notching the first three points before Clondrohid responded with a point from a free. Blarney dominated play in the first half but only went in one point ahead on a scoreline of 0-5 to 0-4. The second half started well for Blarney who claimed an early point but Clondrohid finally began to settle into the game, taking the lead for the first time with a well-worked goal. Blarney kept plugging away and points from Cormac O’Mahony and Conor Foley kept them in touch. Clondrohid’s accuracy improved as the game went on and they pulled away towards the end. It was a disappointing night for Kevin Casey’s men but they can hold their heads high after a brave effort in difficult circumstances. A Special Day for Blarney GAA. At 10am on Sunday the 9th of July a large group of excited young players, parents and coaches from Blarney/Rathpeacon Club na nÓg boarded the bus to Thurles from the club house. It was thanks to the trojan efforts of Niall Hayes and the Club na nÓg mentors that the boys were able to look forward to a great day out including a match against Tipperary’s Boherlahan and tickets to the big game. While the Club na nÓg boys were showing off their skills in Boherlahan, Cathal McCarthy, Laura Shine, Conor Power, Declan Hanlon and Mark Coleman were all preparing to grace the hallowed turf of Semple Stadium on what was to be a very special day for club and county. Declan and Conor were part of the minor panel who took a very impressive win over Clare in the curtain-raiser. Cathal and Laura put in excellent performances in the Primary Game matches, with great support from the crowd. Then it was Mark Coleman’s turn and he put in a phenomenal performance to help Cork to the Munster title. There were fantastic scenes on the field at the final whistle as family and friends converged to congratulate Mark and the lads. Today’s events offered a brilliant illustration of what can be achieved with hard work, skill and dedication. The success enjoyed by all of our players today would not have been possible without the tireless efforts of our coaches, mentors and parents, who support our players as they develop from youngsters lining out for Club na nÓg to Primary Game stars, minor champions and ultimately senior Munster final winners. It’s always special to have a Blarney player representing Cork and today was a high point in our history. With our ever-improving club facilities, outstanding coaches and talented pool of players we’re sure to have many more special days in the future. An Bhlárna Abú!